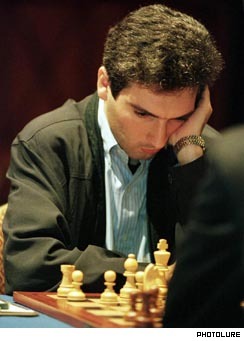 Vladimir Hakopyan is Armenia's top-rated chess player. According to FIDE (Federation Internationale des Echecs) rankings for July 2003 there are four Armenian men chess players among the best 100 in the chess world. The best Armenian chess player is still Grand Master Vladimir Hakopyan, who holds 14th place in the rankings with 2,703 points (comparing with the first place taken by Garry Kasparov from Russia having 2,830 ranking points). Second best Armenian chess player in the world is Grand Master Levon Aronyan taking 44th place with 2,649 points. Then come another two Armenian Grand Masters Rafayel Vahanyan and Smbat Lputyan. Both have 2,623 points holding 71st and 72nd places in the world. Armenian women chess players have only one player in the top 50 FIDE women chess players. Lilit Mkrtchyan with 2,413 points holds 42nd place in the FIDE rankings for women. Sargis Sargsyan of Armenia lost in the first round of Allianz Suisse Open Gstaad International Series tournament taking place in Gstaad, Switzerland from July 7 to 13. Playing on the clay surface he lost 3-6, 3-6 to Jiry Novak from Czech Republic collecting one race point and earning €5,385. This year's third ATP Grand Slam is over and it caused some changes in the ATP rankings. After losing in the forth round of Wimbledon to Mark Philippoussis from Australia. Andre Agassi of USA lost his number two position in the rankings moving down to third place with 472 race points. Like Agassi, David Nalbandian of Argentina lost in the fourth round of Wimbledon (to Tim Henman from UK) but in his case he improved his positions by moving to 20th (from 23rd) with 171 points. Sargsyan also improved his ranking, moving from 47th to 46th place with 97 points. Sargsyan lost in the third round of Wimbledon. The National Chamber Orchestra made a tour of Karabakh last weekend, including an open-air performance at the College of Applied Sciences in Shushi. THe Orchestra is back from a recent tour of Moscow and St. Petersburg.